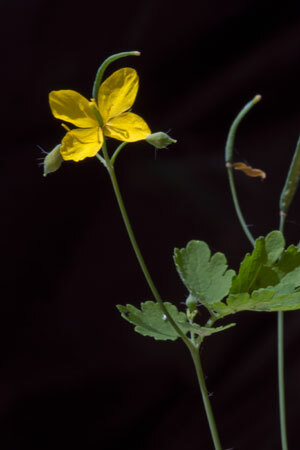 Greater celandine is a common weed in North America and Europe. It belongs to the poppy family (Papaveraceae) and like its cousin the opium poppy, it contains latex rich in alkaloids that have some weak analgesic, antispasmodic and sedative effects. Unlike opioids, it does not produce euphoric effects and is not addictive. Greater celandine is primarily used for cramping and spasmodic pain in the digestive tract like biliary colic. Animal trials show it reduces acetylcholine (ACh)-induced contraction in intestinal smooth muscle. Early herbalists believed the "yellow milky sap" was a sign the herb was useful for liver conditions. Research supports that some of its alkaloids appear to have a choleretic effect aiding in the production of bile in the liver. Although greater celandine is used to treat liver conditions, its alkaloids are slightly caustic, and ironically there are several case reports of it causing drug-induced hepatitis. Therefore, with so many safer liver herbs to choose from, greater celandine should be reserved for only those patients with severe cramping conditions like biliary colic and irritable bowel syndrome (IBS-P) associated with cramping. Isoquinoline alkaloids ( coptisine, chelidonine, sanguinarine, and berberine) are abundant in the yellow sap. These alkaloids also have significant antimicrobial actions that support its traditional use to treat infections. Applied topically, the yellow resin is a useful treatment for warts.